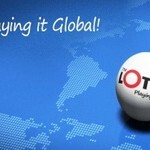 Want to go international with your lotteries? Well, you’re in luck. Online lottery agents make it possible for people from all parts of the world to access dozens of lotteries based in other countries. Some of these have spectacular jackpots; others have great odds of winning. One single question remains – which online lottery agent should you choose? Doing a basic research will outline some of the most popular opportunities. TheLotter and PlayHugeLottos rank among those. So, what exactly are TheLotter and PlayHugeLottos? How are they similar and different? We’re glad you’ve asked! To spare you from doing extensive research, we’ve compiled a list of criteria that help for the easy comparison of the two agents. Let’s start with a brief overview of both lottery agents before moving on to other important characteristics. Founded by The Lotter Enterprises Limited, TheLotter is located in the UK. It was founded way back in 2002 and over the year, TheLotter has established its reputation as a legit international lottery ticket purchase opportunity. Currently, TheLotter gives its members access to 50 international games to choose among. Some of the world’s biggest and most lucrative lotteries can be accessed through the platform. PlayHugeLottos is also registered in the UK – not much of a difference there. Founded back in 1998, this agent has an excellent reputation and a big number of devoted clients. 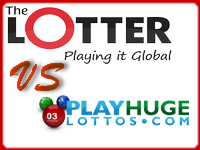 One of the main differences between PlayHufeLottos and TheLotter is that the first one has approximately 15 of the world’s biggest lotteries. As the name indicates, PlayHugeLottos is committed to giving its clients an opportunity to win some of the most spectacular jackpots that the world has ever seen. Taking a look at the platforms that clients get access to, there are some noticeable differences between the two online agents. TheLotter’s design is clean, simple and intuitive. There are step-by-step guides for first-time ticket buyers. An account can easily be created from the top horizontal menu. It also gives access to the lotteries, syndicate gaming opportunities, combined personal and syndicate entries, results and customer support. PlayHugeLottos also has a clean and easy to use website. There are no download requirements and an account is created from the uppermost horizontal menu. The available lotteries are listed on the homepage and the navigation allows for easy access to results, customer support and playing guides. There’s no winner when it comes to website functionality – both agents have done an excellent job, simplifying the process of registration and ticket purchases significantly. Some major differences exist between the manners in which tickets can be bought from TheLotter and PlayHugeLottos. When it comes to buying tickets through TheLotter, the minimum possibility is purchasing three lines. There’s no option for purchasing a single ticket, which obviously brings up the expenditure. If you opt for multi-draw ticket purchases, you will get a 20 percent discount. Anyone who has subscribed to TheLotter information will get every 10th ticket free of charge. TheLotter accepts a number of funding methods. MasterCard, Visa, American Express, Skrill, bank transfers, local payment portals in the respective country and a number of other payment options are available. The payment processing days vary and so does the fee. The method that’s used to buy tickets is also used to withdraw winnings. PlayHugeLottos enables the purchase of individual tickets. The payment methods accepted are the same as what TheLotter has to offer. When trying to deposit funds, keep in mind that for certain payment methods, there’s a minimum deposit amount. 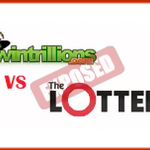 As we’ve already mentioned, TheLotter is the big winner when it comes to available lotteries. There are tens of options to choose among, which is a lot of fun, but it can also get confusing. PlayHugeLottos represents some of the biggest lotteries in the world like PowerBall, EuroMillions, Super Ena Lotto, Mega Millions, France Lotto, Oz Lotto, La Primitiva, El Gordo and various others. To wrap it up, we need to mention a few additional characteristics. As already mentioned, TheLotter features syndicates and other ticket purchasing opportunities. The discounts and free tickets are a big perk. Keep in mind that the more you buy, the more discounts you’ll get access to. Don’t forget, however, to be responsible with the purchases. Customer support at TheLotter is stellar and you get proof that a ticket has been bought on your behalf. The support will also contact you in the case of bigger prizes that can’t be credited to your account but have to be collected personally. PlayHugeLottos has also simplified ticket purchasing – you’ll get email confirmation that the respective numbers have been submitted for the respective drawing. You’ll also get an email after the drawing, showing the winning numbers and telling you whether you’ve won something. Customer support is once again excellent. Whether it comes to collecting your prizes or dealing with a problem, you’ll be capable of reaching the team easily and getting an adequate solution. You don’t have to worry about the legitimacy of TheLotter and PlayHugeLottos. Both platforms have been around for multiple years and they’ve helped thousands of people win prizes from international lotteries. Choosing one platform or another will depend entirely on your style and the lotteries that you’d like to get access to. If you want more opportunities, TheLotter is the online agent for you. Don’t forget, however, that you have to purchase a minimum of three lines (a shortcoming that’s somehow countered by the available discounts). PlayHugeLottos is the platform for people that want to access the lotteries that feature some of the world’s biggest jackpots. The purchase is per individual line, but there could be some minimum deposit requirements. Whichever option you choose, remember to be responsible with the ticket purchases. TheLotter and PlayHugeLottos feature so many temptations. Be strategic about it and don’t go overboard. Great article! Newbies will love it!